A customer recently brought in a knife that was in bad shape. 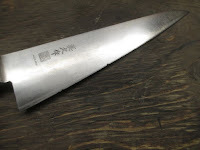 It was s specialised boning knife from Japan known as a honesuki. It had some serious chips and required some close attention. 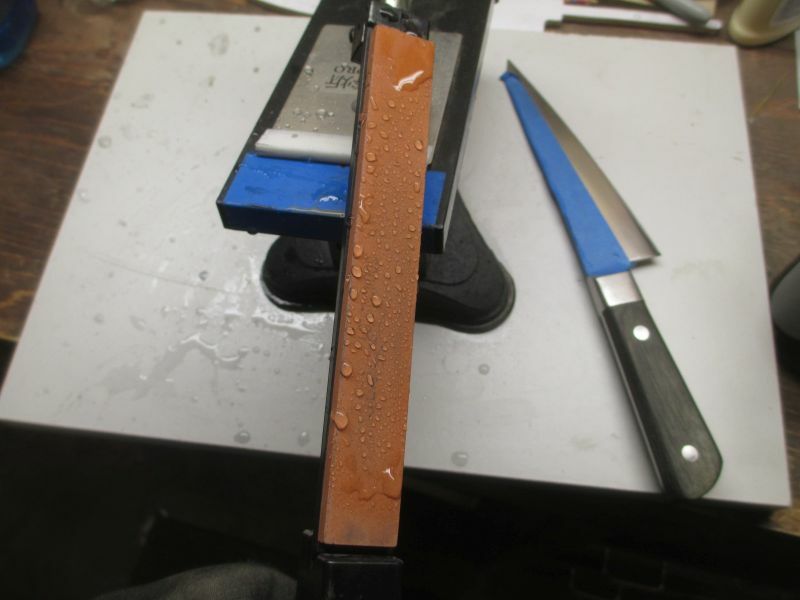 It seems that most every sharpening method have the same things in common--create a wire edge and strop it off. That is, sharpen to a burr and remove the burr with a superfine abrasive. Traditionally, stones we used to make the wire edge and leather was used to strop. In my shop I use belts, stones and a sharpening wheel. Although there are many ways to create a super sharp edge, I have found this method to be quick and easy. This is knife had some nasty chips. I could take them out, but needed to be sure of the geometry. This is an unusual knife with a semi-convex asymmetrical grind. 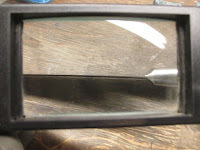 Meaning, it has a convex grind on one side and a flat grind on the other. 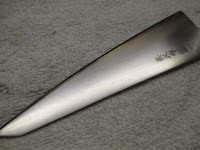 A view of the edge geometry indicates an intentional right-handed slicing type grind. 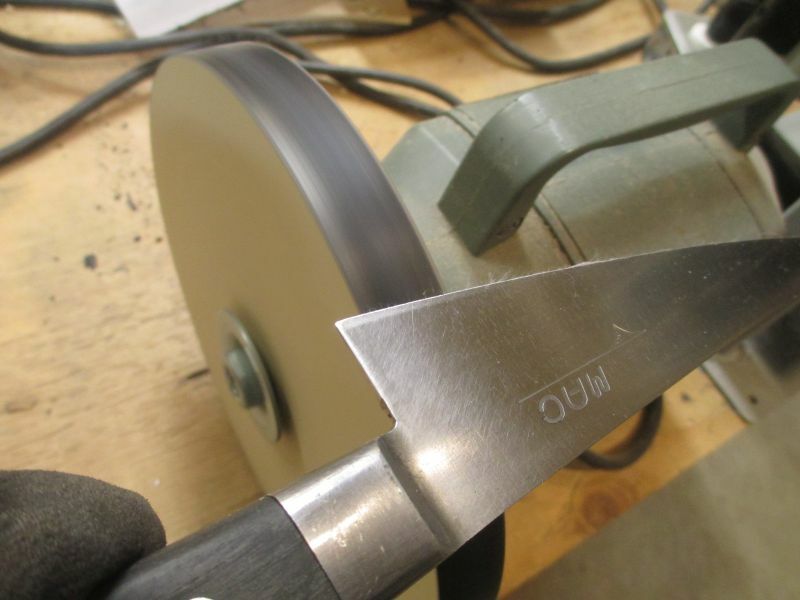 I can now use the belt grinder, stones and strop to sharpen this knife. 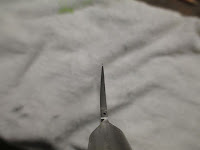 To bring the edge back to a smooth line and remove the gouges, I used a 120 grit ceramic belt at about 1000 surface feet per minute. Edge up and riding the flat platen. Careful attention to the exact angle we are trying to produce. With less abused knives I won't need this step. 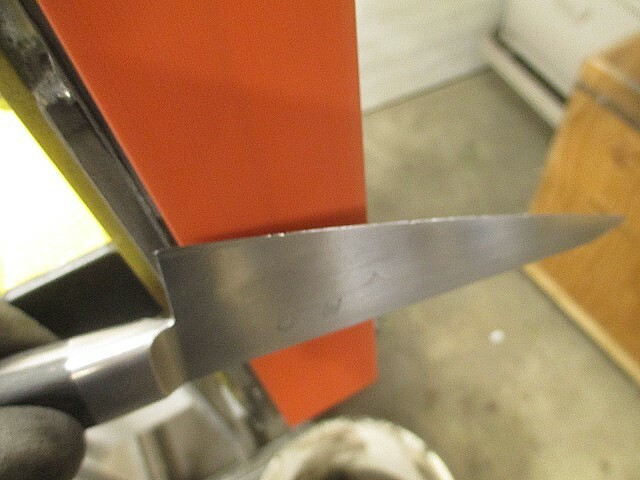 The chips in the edge of this blade warrant some extra grinding. After putting some masking tape on the spine and top of the blade I setup the Ruixin Pro and adjust the angle of the stone to match the secondary bevel angle. Another few passes with a 600 grit stone. Now to the sharpening wheel for some honing with white compound. 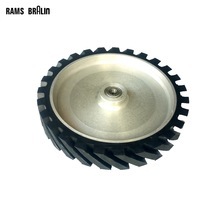 This makes a mirror finish on the bevel and produces a razor sharp cutting edge. Burrs tend to break off and dull the edge more quickly. 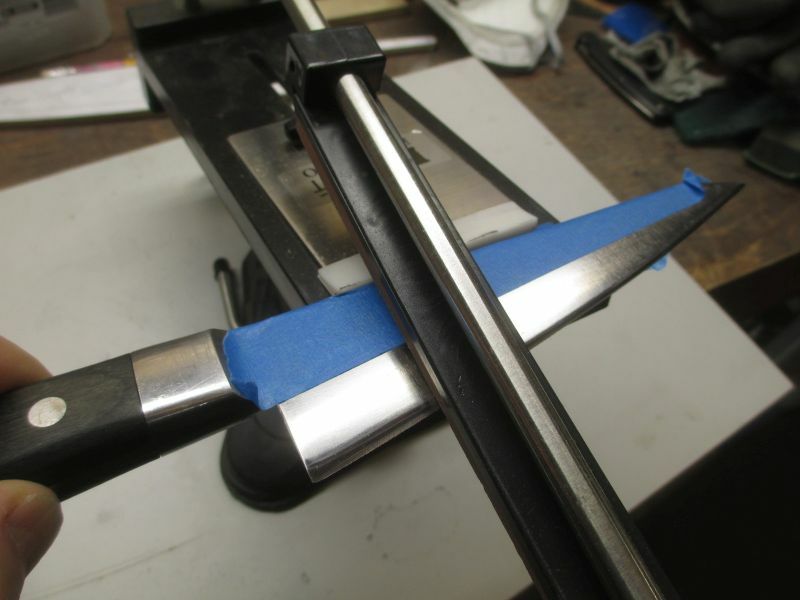 Stropping will remove any burr and leave a razor sharp cutting edge that is less prone to chipping. A visual inspection of the edge with a magnifying glass will help us see if any light is reflecting back. 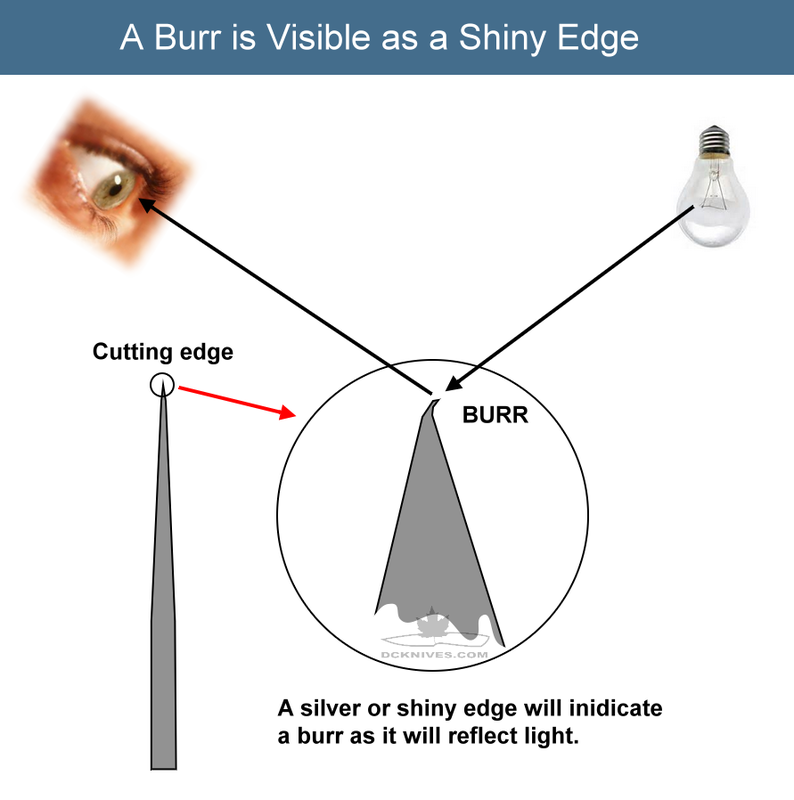 This indicates a burr and will need to be honed away on the sharpening wheel. 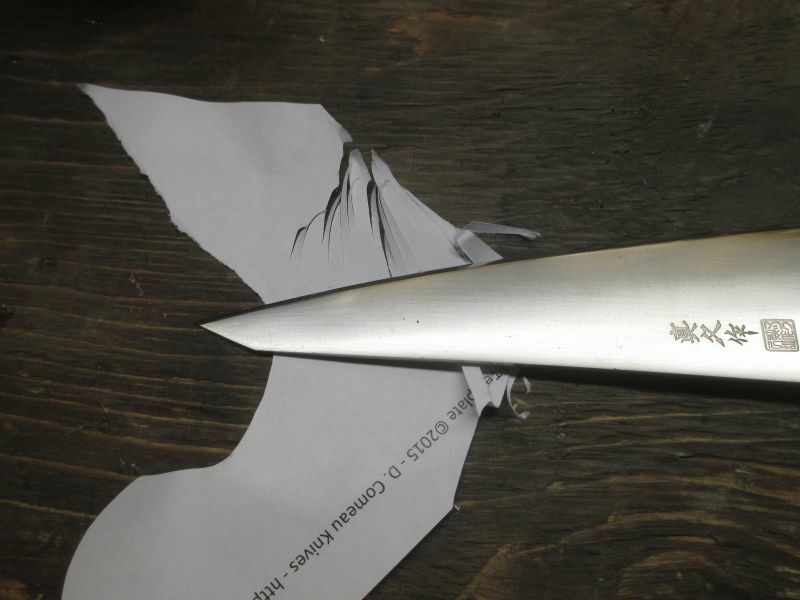 The result is a shaving sharp knife.